Utah Media Group leads the region in newsprint publishing. With the expansion to our West Valley City facility, Utah Media Group installed three state-of-the-art presses designed by TKS Japan. These presses represent the first of their kind and each measures 64-feet high by 410-feet long. 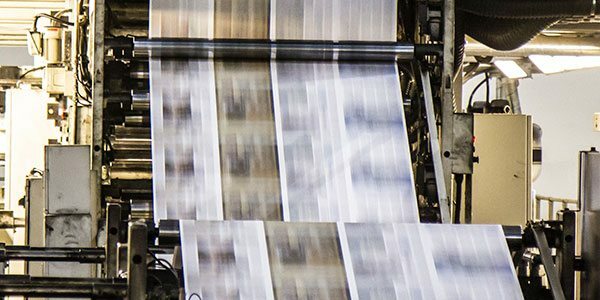 Each press is capable of printing 70,000 copies per hour with the help of sophisticated robotics that lift 2,300-pound paper rolls. Utah Media Group also provides clients any kind of commercial printing services. Whether it’s a magazine, catalog, booklet, flier, brochure, envelope or magnet, we can provide you with the services to handle all of your business printing needs. Call your Utah Media Group account executive for more information 801-204-6300.